The “Start Them Early Program” (STEP). The International Institute of Tropical Agriculture (IITA) received the prestigious Africa Food Prize (AFP) award for 2018. As Director General of the first institution to be awarded this distinguished prize, Dr Nteranya Sanginga has made sure that IITA takes a lead role in pursuing initiatives and innovative research to address food security challenges and employment needs on the African continent. The AFP award is an annual recognition of individuals and institutions that are committed to tackling Africa’s pressing challenges of hunger, malnutrition, and poverty. Since 1967, IITA has focused on improving the lives of millions of Africans in the face of escalating climate change and debilitating crop pests and diseases. The Institute’s push to achieve its mandate, especially the ambitious 2020 strategy, has led to the initiation of the IITA Youth in Agribusiness (IYA) platform as a driver for the delivery of IITA technologies to end users and the creation of employment for African youth. IYA started in August 2012 with the recruitment of a multidisciplinary team of unemployed graduates. IYA is currently active in six countries of sub-Saharan Africa with 385 members and 13 groups involved in 54 different enterprises and startup businesses ranging from fish, livestock, and vegetable production to seed production, processing, and value addition. This program has been successfully adopted by the African Development Bank (AfDB) to create a Pan African Youth in Agribusiness Scheme called Empowering Novel AgriBusiness-Led Employment for Youth in African Agriculture (ENABLE Youth). The scheme intends to reach 1,250,000 youth in 24 African countries who will contribute to job creation, food security and nutrition, rural income generation, and improved livelihoods for youth in both urban and rural areas. The specific objective of the Program is to create business opportunities and decent employment for young women and men along priority agricultural value chains. In his acceptance speech during the 2018 AFP awarding, Dr Sanginga reiterated his commitment to invest in the future of Africa’s younger generation and emphasized the importance of raising the ambition of primary and secondary school students to guarantee a food- and nutrition-secure continent. As a follow up on this promise, Dr Sanginga initiated the “Start Them Early Program” (STEP), an intervention designed to take agribusiness studies to primary and secondary school students. With the $100,000 AFP prize money, Sanginga promised to carry out STEP using a unique approach. 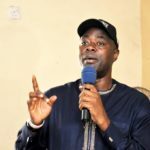 He said the program will redirect secondary schools and their students to agribusiness by engaging them to participate in agriculture-based clubs, course work, and experimental learning. The main objectives of STEP are firstly, to provide primary and secondary schools with knowledge on agriculture and business, and secondly, to train and empower students to change their mindset about agriculture as a business and an opportunity for job creation. Secondary schools in Africa pay very little attention to agribusiness instruction, including those in poorer farming communities. 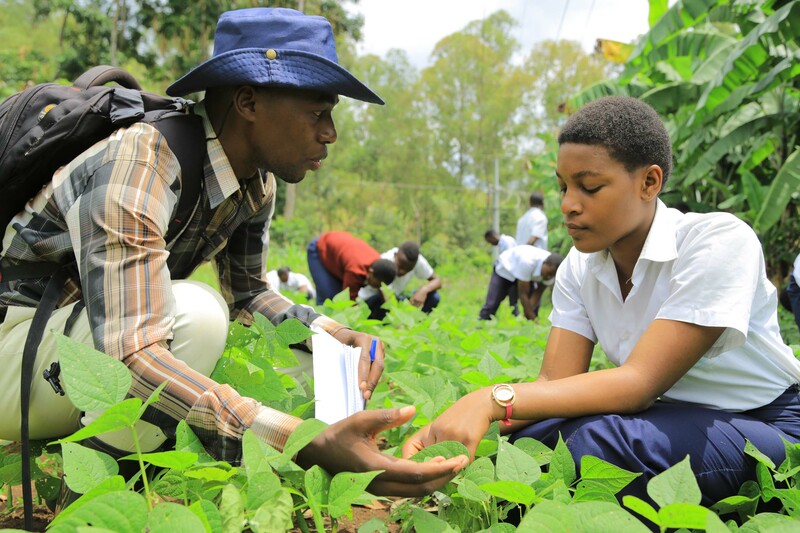 This is partly by design as many students and their families seek to eradicate poverty by attaining knowledge and other skills that do not encourage students to go into agriculture as a means of livelihood. However, this is contrary to the developmental strategy of agricultural intensification and transformation of rural economies through agribusiness. STEP, which is designed to operate in DR Congo, Kenya, and Nigeria for over two years and in nine secondary schools, has been introduced in three secondary schools in Bukavu, DRC, while working with a local organization of young people called NEWDAY Afrika. The program is also about to commence in three schools in Nigeria. Currently, over 800 students have been reached in DR Congo. Thirty-three pupil-initiated agribusinesses are thriving; some are involved in rabbit farming, guinea pig production, poultry, and vegetable production. School managers are also involved in agricultural production, especially in poultry and rabbit rearing to improve school incomes and pupils’ practical knowledge. All DR Congo students involved in the project succeeded in their national country exam with two girls among them scoring the best results, 88% and 84%. Many of them are committed to continue in agriculture at the university level. Exactly six weeks after Dr Sanginga dedicated the Africa Food Prize award to agribusiness development in secondary schools, he initiated the process in Nigeria when he visited the students of IITA International School, to share his strong passion for agriculture and his experiences on how he developed his career in the agriculture sector. The students have also undergone a series of agribusiness training by the STEP team set up by the Director General to commence activities on the program. The curiosity of the students to learn more about agribusiness continues to grow day by day. The team is also working closely with the IITA Women’s Group to engage more students in Ibadan, Oyo State, in the program. Since the program commenced in Nigeria, the STEP team has reached out to more than 100 students from three schools to educate them about the benefits of modern agriculture and different, viable opportunities along its value chain. The IITA Women’s Group supports young people by providing scholarships to students who exhibit exceptional academic excellence but do not have the means to further their education. They have also established viable farms to grow IITA’s mandate crops, including vegetables to showcase to students the basic techniques of planting and managing fields effectively for income generation. The team will partner with farm settlement and incubation facilities such as Fashola Farms and OFFER Centre in Oyo and Osun states in Nigeria, to serve as training centers for students to train intensively on agribusiness particularly on value addition and crop and livestock production. 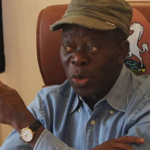 Oshiomole bribery allegation, APC keeps sealed lips.